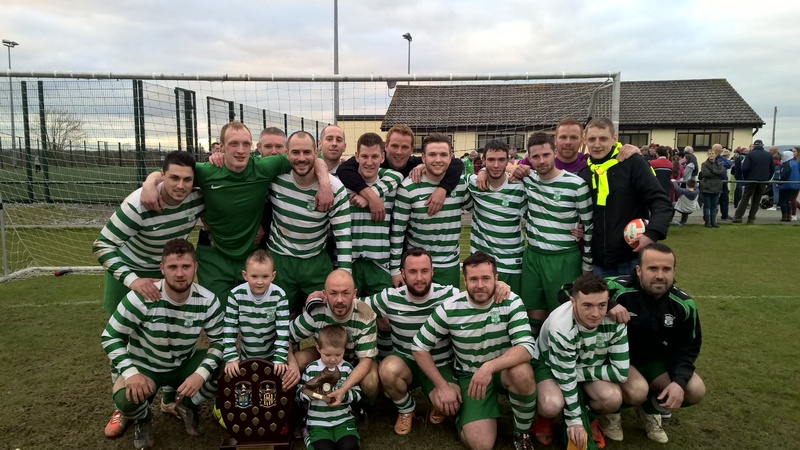 Evergreen retained the Maher Shield trophy after an epic battle in Derdimus on Easter Saturday evening. In front of a large support, Thomastown took the lead after only 4 minutes, when David Kavanagh scored a magnificent free kick from outside the box. This spurred on Evergreen who settled into the game well after going behind and controlled the play in midfield for large periods through the trio of Damian Kelly, Jamie Owens and Sean Barcoe. With the front two of Darragh Walshe and Brian Jordan also working extremely hard, Evergreen were rewarded for a sustained period of pressure after twenty minutes when Sean Barcoe headed in a Chris Whearty corner at the near post. Thomastown fought back and came close to regaining the lead almost immediately when Mick O’Neill hit the post following a mazy run and shot from the edge of the box that had the keeper well beaten. The second half was a tight affair and chances were minimal. The best of Evergreens fell to Sean Barcoe, whose on target header was saved by well the Thomastown goalkeeper. Chris Whearty was also denied by a last ditch tackle when bearing down on goal . Despite Evergreen dominating it was Thomastown who could have won the game in normal time, first through Dessie Walsh with a long range effort and then with 2 minutes to go when Steven Connolly’s point blank shot was well saved by Packie Holden. Extra time continued to serve up a cracking display of football from two committed teams. Chances at both ends however were minimal . Evergreen however were finishing the game stronger and once again pressure told with six minutes remaining when Sean Barcoe flicked on a Tommy Earls throw in and Jason Quan headed in at the back post to give Evergreen the win. Jordan, D Walshe. Subs : J Quan for B Jordan, T Earls for B Hickey, C Snype for S Barcoe.